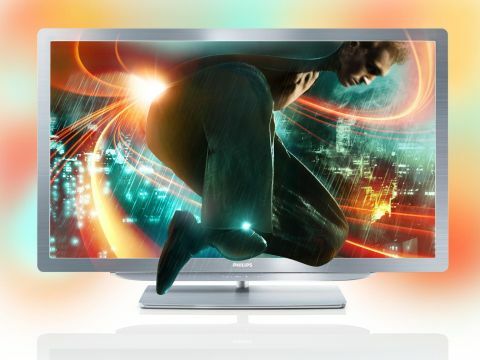 As well as being the long-awaited first TV from Philips' 2011 (just!) range, the 46-inch 46PFL9706H also happens to be the only TV from that range - indeed, the only set in the world, as far as we know - that uses a Moth Eye filter. This being a flagship Philips TV, though, the 46PFL9706 certainly doesn't rely exclusively on its Moth Eye filter innovation. It's also distinguished by direct (where the lights sit directly behind the screen) rather than edge LED lighting, and looks a million dollars in its brushed aluminium bodywork. You also get Philips' unique Ambilight technology where the TV casts coloured light out of the TV's sides and top, as well as one of the most comprehensive multimedia support systems in the business - complete with a much-improved online service. And then, of course, the 46PFL9706 carries the second generation of Philips' active 3D technology (called '3D Max'). The Philips 46PFL9706 is joined in the 9000 series range by the 52-inch 52PFL9706H - though this model doesn't get the Moth Eye filter. If the 46PFL9706's £2,300 price is too rich for your blood, then you could shift down to the 8000 series, comprising the 52-inch 52PFL8605H, the 46-inch 46PFL8605H and the 40-inch 40PFL8606H. This series is cheaper because it uses edge LED lighting, and a less powerful processing engine. For now, though, let's get back to finding out if Philips' new flagship TV lives up to is phenomenal promise. In many ways the 46PFL9706H is the most feature-heavy TV ever. The headliner, of course, is the Moth Eye filter. This carries tiny nodules on it that mimic similar structures found on moth's eyes and are used to eliminate reflections on the screen, resulting in a greatly enhanced perceived contrast range. Certainly the presence of this filter seemed to help the 46PFL9706 produce stand-out performance quality at all of the technology shows it's been featured at this year, where any screen that can 'defend itself' from the high light levels of a typical show floor is going to look special. If you're the sort of person who likes to put numbers on things, then consider this: whereas the 52PFL9706H without the Moth Eye filter boasts a contrast ratio of 5,000,000:1, the 46PFL9706H claims, incredibly, 50,000,000:1. Or if you're struggling to get your head round all those zeros, the Moth Eye filter potentially delivers 10 times the contrast of a non-Moth Eye TV. Obviously all these sorts of numbers have to be treated with an enormous pinch of salt, but nonetheless it's impossible not to get at least a bit excited at the thought of what the filter might do.